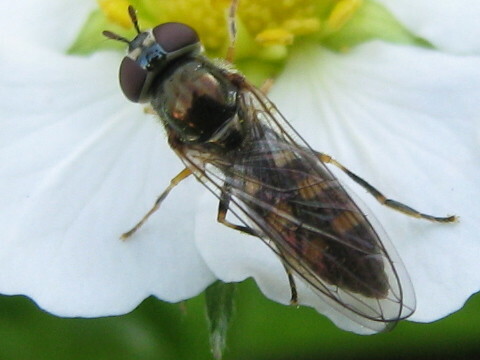 It’s easy enough to find beautiful flowers, now that the weather has warmed up, but you need to look really close to spot one of these beautiful little syrphid flies. There’s a whole range of these predatory flies, often dressed in beelike yellow and black. 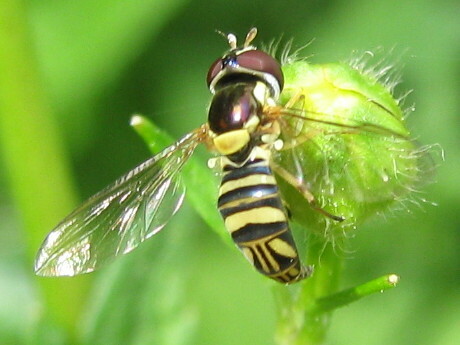 Some like this Allograpta obliqua are hover flies. You might just barely see a tiny speck of a dash hovering near the flowers, then shifting side to side or zigzagging about, as if looking for something. Then if they stop and your camera gets a good look, you might see just how beautiful they are. Sometimes you hear them first, sounding like a bee buzz, only louder and more whiny. 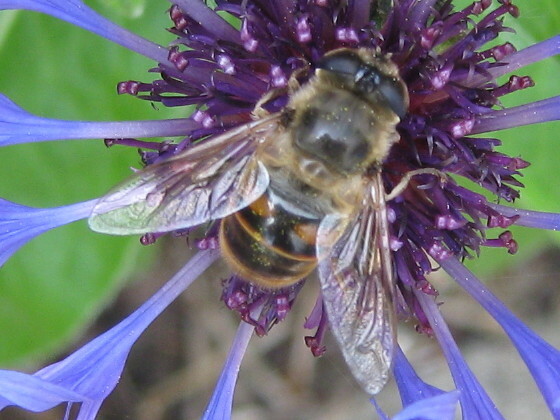 These often look like bees too, bee-sized, and bee-patterned, like the Drone Fly (I think) on the left. Others I don’t have a clue about until I upload the photos, just a little of the “What’s that?” excitement when I catch sight of a mysterious bug zipping about, like the Platycheirus on the right. Commonly, the larvae eat aphids and the adults drink nectar, like a cross between ladybugs and bees. So they’re good for the garden, and it’s good to see them.